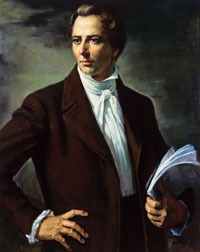 Erik Ramsey’s SMITH UNEARTHED poses this question: How did Joseph Smith, Jr., a failed oracle and convicted conman, rise to become the prophet and founder of the Mormon Church – arguably the fastest growing religion in the world today? The play chronicles the days leading up to Christmas, 1825 when Joseph Smith, Jr. and his father, on the run from the law, return in disgrace to the family farm in upstate New York to save their house from being repossessed. In the process of escaping the clutches of both their creditors and the investors they’d recently fleeced, they lay the foundations of Mormonism. Based on historical accounts of Mormonism’s early years, SMITH UNEARTHED dramatizes the moment in time when Junior first begins to believe he has been spiritually imbued with the true story of the American continent: that Native Americans are actually a lost tribe of Israel and that he, Joseph, is the one man who knows the history of Jesus Christ’s appearance to them here. Disillusioned by his failures dowsing for precious minerals as a “seer for hire”, and disappointed in himself for turning his gift for divination into a cynical grift, Junior hopes to marry and find a simpler life free of prophecy, real or invented. But instead of climbing from the legal and ethical hole he’s dug himself into, he digs deeper and strikes a different kind of gold. No scholars deny Smith practiced magic, but no one knows for certain if that magic was simply a combination of charisma and sleight of hand or truly anointed and supernatural. SMITH UNEARTHED asks an audience to divine the truth of the matter for themselves. Posted in Uncategorized on December 8, 2008 by Erik Ramsey.